That is NOT helpful... I already bought the fans!!! Last edited by Lysrin; April 15, 2019 at 03:09 PM. Where'd you order from? That doesn't sound right and hopefully they'll refund you. From what I can tell, you should have no issues fitting a 360 rad with fans up front along with a 240 in the top if that's what you're thinking. That seems basically the defacto when you search "meshify loop" in Google Images. I like that Radikult reservoir that mounts in the top and lets so much more light into the case. A bit pricey though... A good example of doing it without any bends either, along with a drain near the bottom area. I'm not big on flow meters/temperature sensors though. 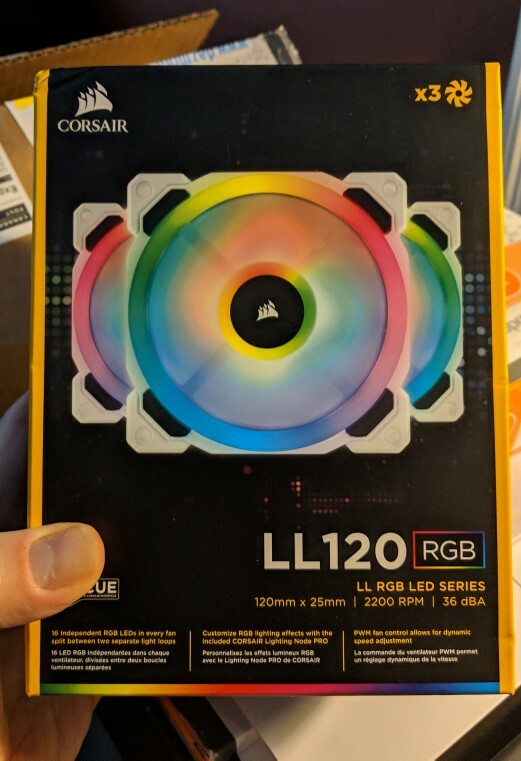 Ordered from Newegg.ca. No matter what I tried I couldn't get them grouped together online. Must have come from different location perhaps? And yeah that is a pretty neat build! I hadn't seen that one in all my searching. The no bends option for the hard tubing is a neat look too, but it is more expensive given you have to buy all those fittings! I am thinking 240 top, and I was thinking 240 front, mounted towards the top to give me more space in the lower chamber. Then I was thinking 360 in front with two fans only, still leaving space in the bottom. That led to my question a few posts ago. Not sure. Just thinking long term I'll reuse or appreciate having a 360 rad. Last edited by Lysrin; April 15, 2019 at 03:19 PM. Hrmmm... I'm surprised at how much room it looks like there is between the rad and the side panel..... I'll have to double check the specs... is the meshify C exceptionally wide? (It really bites not being able to go into a proper PC store to see cases in person..... ). No, not exceptionally wide. Case dimensions (LxWxH) 395 x 212 x 440mm. Width on my former Corsair 650D was 229mm for comparison. Hmm... maybe I am going to have go 240 in the front. I really want to do cross-flow rads and a slim 360 cross-flow appears to be very scarce. There must have been a DarkSide one at one point as Google finds it in DazMode pages, but when you try to access it's a dead link. If you check Daz store (not Google), you'll see he has a few crossflow 360s. But not Darkside ones, only Alphacool, and those are a bit pricey. Nice rads, but filthy (need serious flushing before use), and expensive. Thanks! Yes I did see those ones when I was searching Daz's site, but they are pricey as you said, but more importantly they are not slim. I really need slim in the Meshify C.